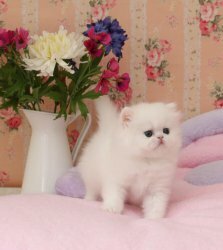 We are proud to announce that we have a litter of gorgeous Persian kittens for sale. Only 2 males and 2 female left 12 weeks old and ready for their new homes. They are an amazing friendly kittens, used to other cats, litter trained and enjoys being picked up by people. They has been brought up in a loving household with children. For pet home only! The kittens are vet checked , flead and wormed and will come with 8 weeks FREE insurance , they are all litter trained , Any questions please ask , They have beautiful eyes.